Esperanza Spalding is not an artist who disappoints. Nor is she predictable. Her latest release, Emily’s D+Evolution, has shown an exceptional rebirth of creativity and innovation from the prodigal bassist/singer-songwriter. Using her jazz background as a pedestal, she constructs an intricately structured opus incorporating funk and alt-rock elements to create an experimental blend of performance art, theatre, improvisation, and classic storytelling through song. The title, Emily’s D+Evolution, is based on Spalding’s “alter ego,” a free spirited young girl named Emily (Spalding’s middle name). 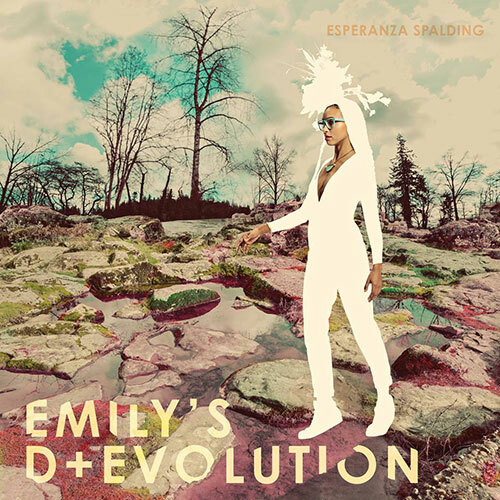 Spalding sings about the world as seen through Emily’s eyes, using her as a musical muse. She claims using this alter ego gave her a fresh start to her work, a way to approach the concept of music anew. The album represents a rebirth of creativity for Spalding, a return to the childlike wonder and ingenuity. Emily’s D+Evolution opens with the lyrics, “See this pretty girl / Watch this pretty girl flow,” an immediate introduction to the muse behind the melody. As for the artistry, Spalding does not disappoint. She has tremendous vocal talent, easily ranging multiple octaves from a honeyed alto to a soaring falsetto in one breath. Her lyrics are complex and intelligent, a mix of story, song, and spoken word poetry. The instrumentals are expertly layered, with intricate melodies and subtle key changes; at times an ebb and flow, at others an overwhelming roller coaster of emotion and rhythm. While it is recommended to listen to Emily’s D+Evolution all the way through to get the full experience, some tracks deserve high praise. The opener, “Good Lava,” is all at once a dissonant, explosive, and seductive first track. It shocks the listener, screaming at them to pay good attention – without ever raising its voice. “Judas” provides a respite from this overwhelming sensation. Spalding’s vocals are lilting and low, fluid in tempo and rhythm; a hybrid of song and spoken word. Her bass-playing is prominently displayed, with stripped-down cymbals and accompanying electric and acoustic guitars. “Rest In Pleasure” is intimate, and again the production has been pulled back, letting Spalding’s lyrics and vocals shine through. She is accompanied by a female call-and-response for the chorus, adding a layer of sensuality and delicacy to the track. A crescendo is present in the latter half of the song, where the volume, intensity, and instrumental layering all increase. “Ebony and Ivy” is a dead-ringer for a poetry slam performance put to music, starting out with rapid-fire, monotone lyrics that soon swing into pensive vocals and a jolting melody. Emily’s D+Evolution ends with a peculiar track, “I Want It Now,” which apparently is an homage to Veruca Salt of Charlie and the Chocolate Factory fame. More theatre than song, it is an ending both surprising and surprisingly fitting: seeing as the muse is supposedly a young girl, the emulation of unfettered desire through a popular literary character is a perfect, though subtle, solution to end such a complex album. Overall, Emily’s D+Evolution is a piece of art, off-kilter and unhinged just enough to be unique and noteworthy. It pushes boundaries without being disorganized, and flirts with the blurred lines between performance and production in a way that leaves the listener exhilarated. Though it is unclear what paths she will pursue next, Spalding is certainly one rising star to watch closely and with great excitement. This entry was posted in CKUT programming, Reviews and tagged album review, alt-rock, Emily's D+Evolution, Esperanza Spalding, funk, Jazz, new release on March 16, 2016 by Juliana Van Amsterdam.